Some decisions that reflect my own nominations for the year, many others for plays I haven’t seen and as ever, some curious choices too. I was snowed out of my original trip to Pippin at Southwark Playhouse and it has taken me more than a little while to be able to fit it back into my schedule. But although the production has had some excellent word of mouth, it wasn’t the one for me, unable to shake my feeling that this is a musical of which I’m just not very fond. It’s no secret at all that I love a good old-fashioned musical but it is hard to feel that we need more of them in the world. 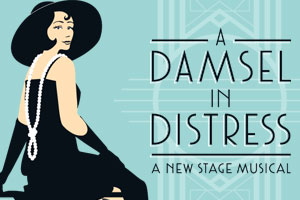 PG Wodehouse’s A Damsel in Distress started life as a novel in 1919, has been adapted on both stage (with Ian Hay) and screen, where it was augmented by a suite of songs by George and Ira Gershwin, and now finds itself as a piece of musical theatre with a new book by Jeremy Sams and Robert Hudson and vibrantly directed and choreographed by Rob Ashford.